It never ceases to amaze me as to how much free quality content there is available on the web. I mean this in all respects: from Wikipedia to the BBC to ManageWP (of course ;-)). The only downside is that there tends to be a whole load of crap you have to sift through to get to the good stuff. Well, with our monthly links mashup, I do all the hard work for you and leave you with just the cream of the crop. And what a crop it is this month — us WordPress bloggers have been busy! I have a bumper selection of posts for you today. They’re not all directly WordPress related either; some articles are too good not to recommend, regardless of the topic. A Few More Myths of Running a Theme Business — one for the aspiring developers out there; John Saddington gives us an honest expose on what it’s really like to run a theme business. How to Properly Comment Your Themes and Plugins — nothing is worse than poorly formatted code, and that includes comments. 6 Simple Tips For Learning CSS For WordPress — a great primer for those interested in learning CSS (I highly recommend that you do). 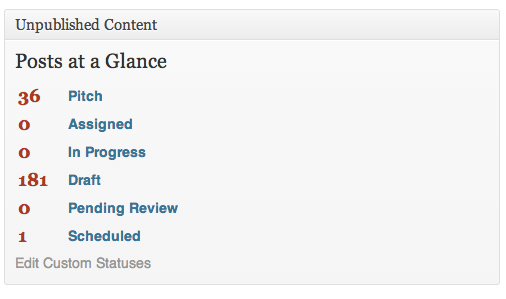 How To Create A Tab Widget In WordPress — a widget with tabs? What’s not to love? Redirect To Post If Search Results Return One Post — save your visitors a bit of time with this nifty script. 5 Things to Consider When Finishing a Site — a good checklist to have to hand when you’re ready to go live. Moving A WordPress Website Without Hassle — moving a WordPress website can be a complicated process (unless you use ManageWP’s clone feature of course ;-)) but this great step-by-step guide makes the process as straightforward as possible. Set Minimal Comment Limit In WordPress — ensure that only well thought out comments are published on your blog! How to automatically insert a list of related articles below the post — if you’re not keen on using a plugin for this kind of functionality then here’s your answer! What to Do When a WordPress Plugin Causes Your Website to Crash — a nice step-by-step guide to recovering a site when a plugin makes it go kaput. Using EditFlow as a Repository For Posts — an excellent overview of how to keep pitch, draft, and scheduled posts in order on your blog. How to Avoid Theme & Plugin Shortcode Conflicts in WordPress — conflicts in WordPress are always a pain and can be very difficult to diagnose, so this guide is a welcome addition. TinyPNG: Simple Image Compression for Bloggers — a great little tool for making your PNG files smaller with near-lossless compression. I’m still here: back online after a year without the internet — compelling reading. Check it out. It’s been an absolute bumper month for infographics — we’ve got everything from SEO to WordPress birthday celebrations covered below. Click the infographic to visit the source. Enjoy! Cool infographics, and thanks a lot for the article about plugin conflicts. Very useful! 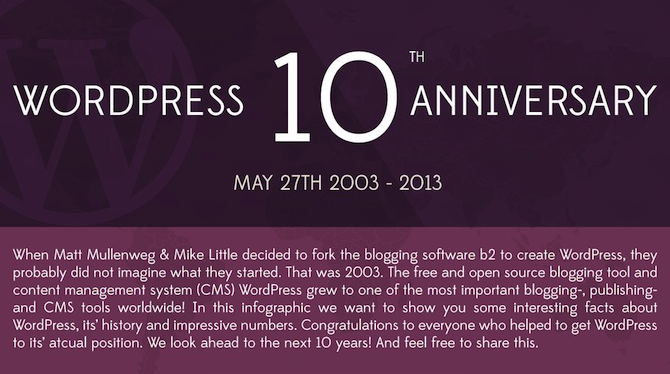 Nice to see some great 10 year wordpress anniversary infographics that show the progression of the platform.